From about age eight, Jay Rudolph knew he wanted to be a radio announcer. So, when the dream became a reality as a senior in high school, no one was really surprised. Jay grew up in Fond du Lac, Wisconsin – not far from Lake Michigan. 4-H and animals dominated a big part of Jay’s life. Dairy goats are one of Jay’s passions. He has raised Saanen dairy goats for more than 40 years; and along with his wife, Amy, operated a commercial dairy goat farm, shipping the milk for cheese, for six years. Jay is also very active in judging dairy goat shows across the country. He is also on the board of the Cornerstone for Life pregnancy resource center in Algona. Jay and Amy have seven children. Lydia was born on March 22,1999; Benjamin on September 19, 2000; Ethan was born September 17th, 2002; Micah, April 16, 2004; Levi, May 17, 2006; and Anna, April 28, 2008; Will, August 4, 2010. They both enjoy spending most of their time with the family. Amy grew up in Chilton, Wisconsin – about 30 miles from Jay. They met through a mutual friend; and as Jay likes to think, fell in love instantly – well, he did anyway! They were married December 21, 1996. 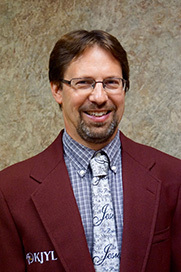 Jay had worked in secular radio in Fond du Lac, Wisconsin, for 15 years before coming to KJYL. How Jay and Amy came to Iowa in 2000 is a testimony of God’s faithfulness. While they had been seeking God’s will for their lives, God opened their eyes to a number of opportunities through the Christian placement agency Intercristo. Jay sent in an application that turned up several possibilities. However, after a lengthy interview process with KJYL, Jay was easily convinced that this was the position the Lord had called him to. The Rudolphs’ mobile home they had been trying to sell for some time sold immediately after they returned from a visit to KJYL. Their herd of 100 registered dairy goats sold to the highest bidder for considerably more than their asking price, and the Rudolphs found a nice acreage near Renwick for a very affordable price. These were all circumstances that they see as things only God could bring about in order to prepare them and show them that He had made the call to come to Eagle Grove, Iowa. Jay and Amy are excited to continue to serve the Lord in this area, and he is thrilled to be involved with sharing the Gospel over the airwaves!